After carrying his team to victory in game 1, Mike put Loss Mitigation on his shoulders again in game 2. His walk-off two-run homer in the bottom of the sixth capped another great performance and gave his team a comfortable lead in the best-of-five first round series with the Porkswords. Norris took the mound for Loss Mitigation, and he looked good early. After allowing a leadoff double to Adam, he retired Frosty and Josh to strand the runner, ending the inning. With three innings of eligibility left after game 1, Josh started once again for the Porkswords. He rolled through the bottom of the first, retiring Mike and Nate in order. 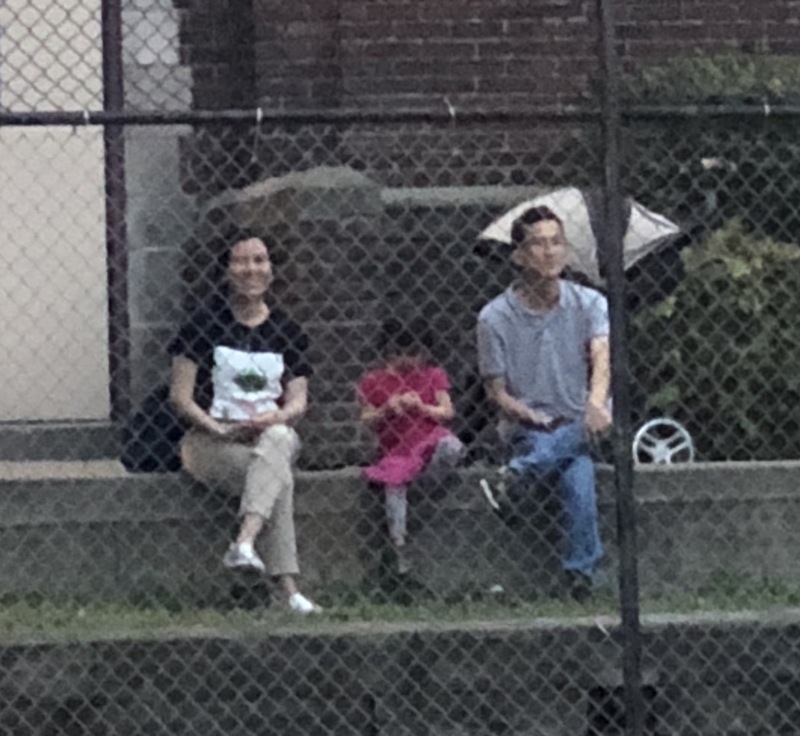 A family of three watches the EWL playoff action from the third base line stands. Bob singled to start the top of the second, but the Porkswords couldn’t get on the board, as Norris retired Adam and Frosty to strand the runner and end the inning. Loss Mitigation would take a lead in the bottom of the second. Norris tripled to start the inning, but he was caught out in between third and home trying to extend the hit into an inside-the-park homer. Reggie followed with a triple, and Mike drove him in with a two-run blast, making the score 2-0. Josh retired Nate to end the inning, and he had met his innings limit for the week. With a two-run lead, Norris rolled through the top of the third, sending Josh and Bob down consecutively. Norris is pleased with his squad’s performance in game 2. Loss Mitigation extended their lead in the bottom of the third. Adam entered the game for Josh, and he was hit hard right away. Norris singled, and Reggie drove him in with a two-run homer, making the score 4-0. The next batter, Mike, tripled, but similar to Norris in the previous inning, he was caught out between third and home trying to extend the hit into an inside-the-park homer. Nate followed with a single, but Josh avoided further damage, retiring Norris for the second out of the inning. The Porkswords cut into the four run deficit in the top of the fourth. Frosty doubled with one out, and Josh drove him in with a two-run homer to right center. Norris retired Bob to end the inning, and the Porkswords had cut the score to 4-2. Reggie singled to start the bottom of the fourth, and two batters later, Nate hit an RBI triple, pushing the Loss Mitigation lead to 5-2. Josh retired Norris to end the inning, and the Porkswords trailed by three runs. Norris connects on one of his two hits in the game. The Porkswords rallied once again in the top of the fifth, tying the game. Adam led off with a triple, and he scored from third on Frosty’s RBI single that cut the score to 5-3. Two batters later, Bob doubled to put runners on second and third, and Adam cleared the bases with an RBI triple, his second three-bagger of the inning. Norris retired Frosty for the second out of the inning, but he had allowed three runs, and the game was tied at 5-5. Frosty, who made his triumphant return to the wiffle diamond, celebrates after scoring a run in the fourth inning. Loss Mitigation pulled back ahead in the bottom of the fifth. Reggie tripled for the second time in the game, and Mike drove him in with an RBI double that made the score 6-5. Adam retired Nate and Norris to end the inning, and the Porkswords needed a run in the top of the sixth to extend the game. 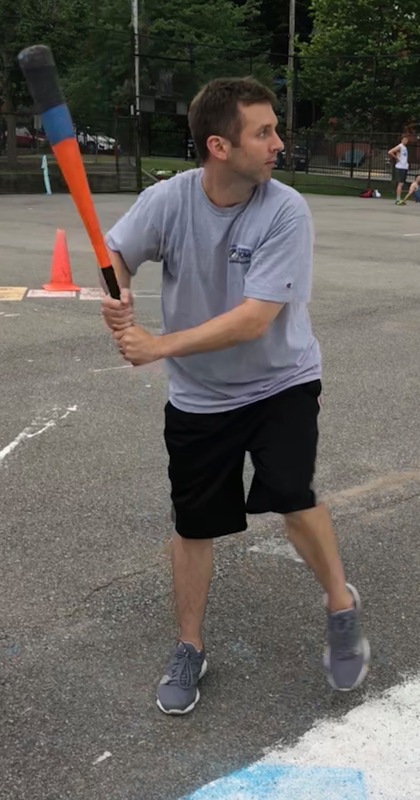 Nate, who went 2-for-5 with a single and a triple for Loss Mitigation, poses for the wiffle camera. Josh led off the final frame with a triple, and Bob came through in the clutch, hitting an RBI single to tie the game at 6-6. Norris retired Adam and Frosty to end the inning, but the Porkswords had evened the game for yet another time. With a chance to walk-off with a two game lead in the series, Mike and Loss Mitigation did just that, on cue. Reggie singled for his fifth hit of the game, and Mike, who had reached base safely in nine of his first eleven at-bats of the series, came to the plate. He delivered for Loss Mitigation again, crushing a two-run bomb to right-center, ending the game, and giving Loss Mitigation an 8-6 victory. 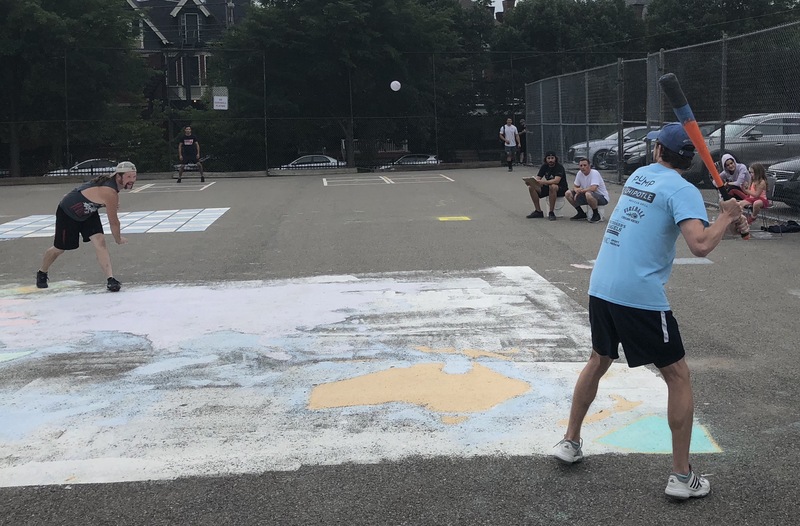 The win put Loss Mitigation ahead 2-0 in the best-of-five first round series with the Porkswords, one win away from clinching a berth in the 2018 EWL Wiffle Series. – Norris pitched the complete game win for Loss Mitigation, allowing six runs on ten hits in six innings. – Adam took the loss in relief for the Porkswords. He gave up six runs on ten hits in three innings pitched. – Josh started for the Porkswords and earned a no-decision, giving up two runs on three hits in two innings. – Mike led Loss Mitigation on offense, going 4-for-6 with a double, a triple, two home runs, two runs scored, and five RBI. He became the first player to hit a walk-off home run in the EWL playoffs since Nate hit two for Eastbound & Dahn in the 2015 playoffs. – Reggie White was a perfect 5-for-5 in the game, with two singles, two triples, a home run, five runs scored, and two RBI. – Adam led the Porkswords at the plate, going 3-for-6 with a double, two triples, a run scored, and two RBI. Erich had a historically dominant performance in game 2, going 8-for-8, hitting for the cycle twice. 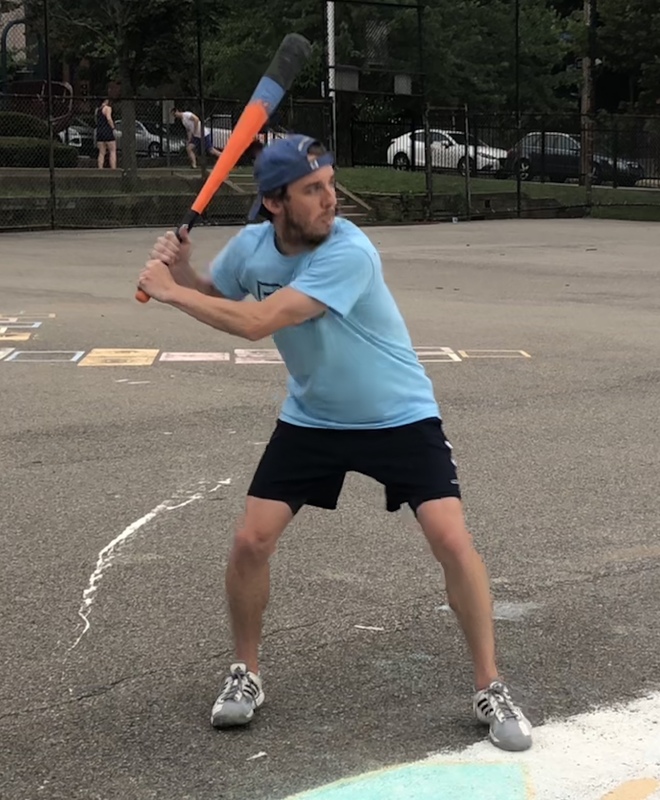 After sputtering on offense in a game 1 loss, Shady Characters exploded for nineteen runs in game 2, as Erich hit for the cycle twice in the same game, and the best-of-five first round series was evened at 1-1. Erich was 8-for-8 with two singles, two doubles, two triples, two home runs, six runs scored, and five RBI, becoming the first player in EWL history to hit for the cycle twice in one playoff game. Dylan, Tom W, and Jason each had five hits, and Shady Characters scored nineteen unanswered runs after falling behind 2-0 in the top of the first. Dylan pitched the complete game win, and he also set the EWL single-game playoff record for triples, with four, shattering the previous mark of two. 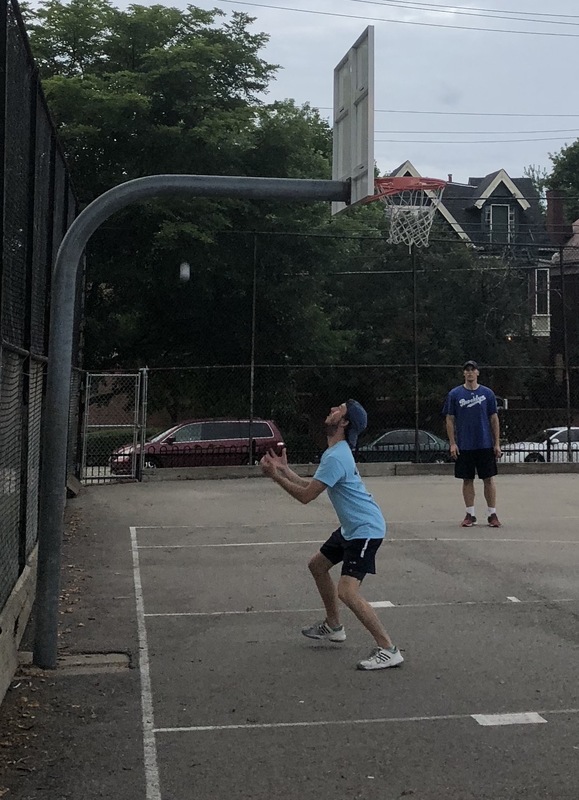 Cheap Goats got to Dylan early in the top of the first, but after taking an early lead, they wouldn’t score again until late in the game when they trailed by double digits. Jordan led off the game with a triple, and he scored when Joey followed with an RBI triple that made the score 1-0. Christian then singled, scoring Joey, and Cheap Goats led 2-0. Just when it looked like Cheap Goats may jump out to a big lead in both the game and the series, Dylan retired Dinger and Jordan to end the inning, and his offense took over in the bottom half of the inning. 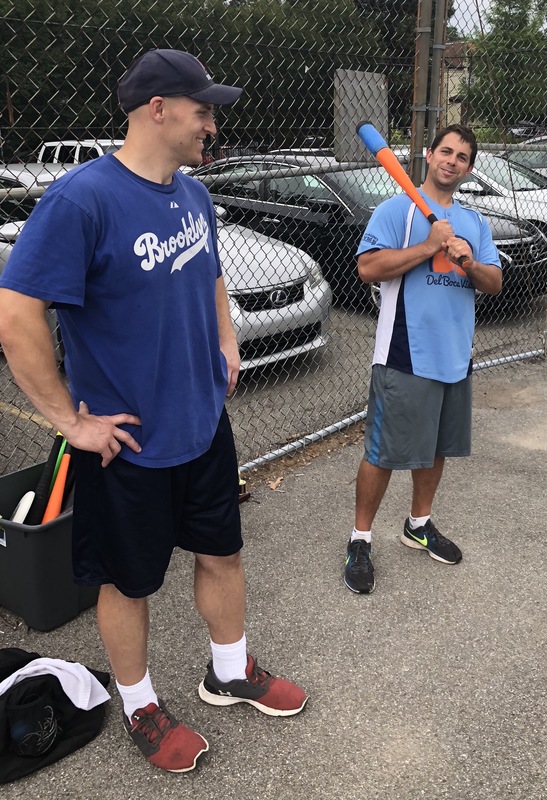 Tom W had five extra-base hits, including three two-run bombs, propelling Shady Characters to the big game 2 victory. Dinger took the mound for Cheap Goats, and he got into trouble early. Dylan led off the inning with a triple, and Tom W tied the game with a two-run homer, making the score 2-2. Erich followed with a triple, and he scored from third when Jason grounded out for the first out of the inning. Dinger then retired Dylan to end the inning, and Shady Characters led 3-2. Joey led off the top of the second with a double, but Cheap Goats couldn’t tie the game. Dylan retired Christian and Dinger to strand the runner, maintaining the one-run lead. Shady Characters would pull ahead to a comfortable lead in the bottom of the second. Tom W doubled, and he scored from second on Erich’s RBI single, making the score 4-2. Jason then doubled, scoring Erich, and Shady Characters led 5-2. Dylan followed with his second triple of the game, scoring Jason, giving Shady Characters a 6-2 lead. Tom W grounded out for the first out of the inning, but Dylan scored on the play, extending the lead to 7-2. 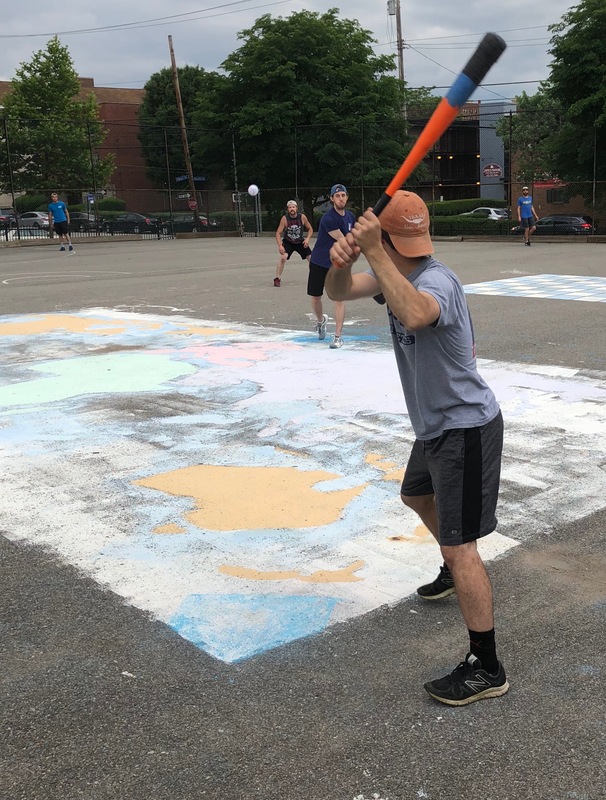 Erich followed with a double, but Dinger finally got out of the inning, retiring Jason to strand the runner, and Cheap Goats trailed by four runs. Dylan rolled through the top of the third, retiring Jordan and Joey in order, and Shady Characters blew the game open in the bottom of the third. Dylan had a strong game at the plate and also kept Cheap Goats in check on the mound, producing scoreless innings in four of the six innings he pitched. Dylan led off the inning with his third triple of the game, breaking the single-game playoff record. Tom W followed with his second two-run home run of the game, pushing the lead to 9-2. Erich tripled for the second time in the game, and Jason followed with a two-run shot, making the score 11-2. Dylan tripled yet again, extending his single-game record to four triples, and Tom W hit his third two-run blast of the game, and Shady Characters now led 13-2. Dinger was removed from the game, and Cheap Goats turned to Christian from the bullpen. The first batter he faced, Erich, doubled, and Jason drove him in with an RBI triple. 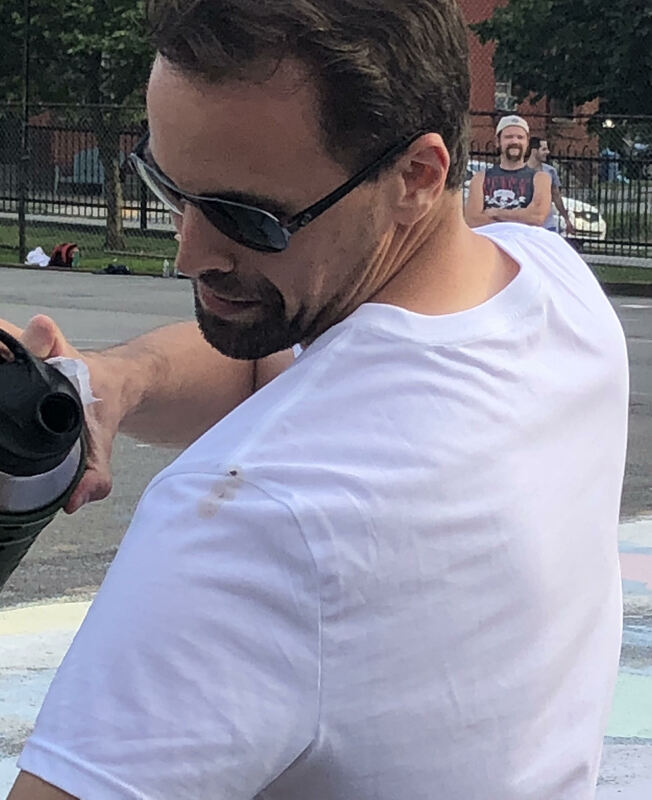 The inning finally ended when Christian retired the next two batters, Dylan and Tom W, but Shady Characters had scored seven runs in the inning, essentially putting Cheap Goats away with a 14-2 lead through three innings. Christian doubled to start the top of the fourth, but Cheap Goats couldn’t rally, as Dylan retired Dinger and Jordan to strand the runner, ending the inning. Shady Characters continued to pile it on in the bottom of the fourth. Erich led off the inning with a solo homer, giving him the cycle, and the lead was 15-2. Jason followed with his second triple of the game, and Dylan drove him in with an RBI double that made the score 16-2. Two batters later, Erich hit a one-out single, scoring Dylan from second, and Shady Characters led 17-2. Christian retired Jason for the second out of the inning, and Cheap Goats trailed by fifteen runs. Dylan connects on one of his EWL single-game playoff record four triples. Dylan continued to mow down Cheap Goats hitters in the top of the fifth, sending Joey and Christian down in order. Shady Characters finished their offensive onslaught in the bottom of the fifth. Joey came to the mound, making his first pitching appearance of the 2018 season. He retired the first batter he faced, Dylan, but then Shady Characters would add a few more insurance runs. 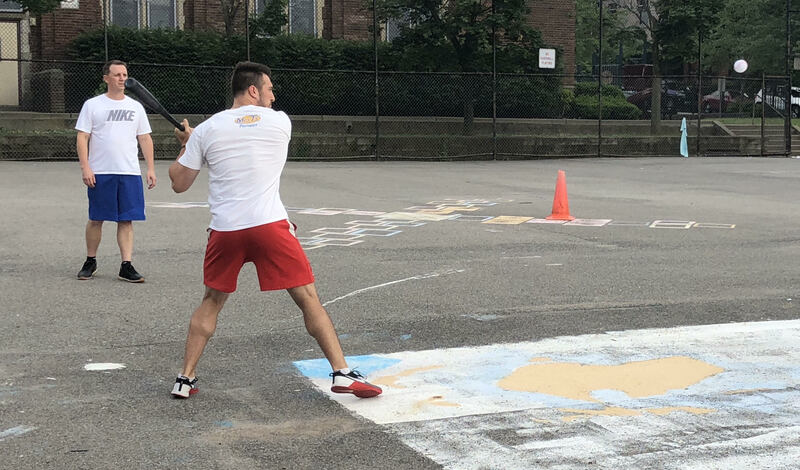 Tom W doubled, and Erich completed his second cycle in the game, hitting a mammoth two-run shot to right, putting Shady Characters ahead 19-2. Jason followed with a double, but Joey escaped further damage, retiring Dylan to end the inning. Shady Characters had scored two or more runs in every inning, with nineteen unanswered runs, and led by seventeen runs heading into the sixth. Joey connects on a solo homer in the top of the fifth. He was 3-for-5 with three extra-base hits in the blowout loss. Cheap Goats showed some life in the top of the sixth, but it was far too little too late. Dinger started the inning with a single, and Jordan followed with a two-run homer than cut the score to 19-4. Joey followed with a solo homer, and the back-to-back jacks made the score 19-5. The rally would end there. Dylan fanned Christian for the first out of the inning, and then retired Dinger to end the inning and the game. The 19-5 Shady Characters win evened the best-of-five first round series at 1-1. – Dylan pitched the complete game win for Shady Characters, allowing five runs on eight hits, striking out one in six innings. – Dinger took the loss for Cheap Goats, giving up thirteen runs on fourteen hits in 2.5 innings pitched. – Christian and Joey both pitched out of the bullpen for Cheap Goats. Christian pitched two innings, allowing four runs on six hits. Joey pitched a single inning, giving up two runs on three hits. – Erich led Shady Characters on offense, becoming the first player in EWL playoff history to hit for the cycle twice in one game. He went a perfect 8-for-8 with two singles, two doubles, two triples, two home runs, six runs scored, and five RBI. – Dylan went 5-for-9 for Shady Characters, with a double, a record-breaking four triples, five runs scored, and two RBI. – Tom W went 5-for-8 for Shady Characters, with two doubles, three home runs, five runs scored, and seven RBI. – Joey led Cheap Goats at the plate, going 3-for-5 with a double, a triple, a home run, two runs scored, and two RBI. 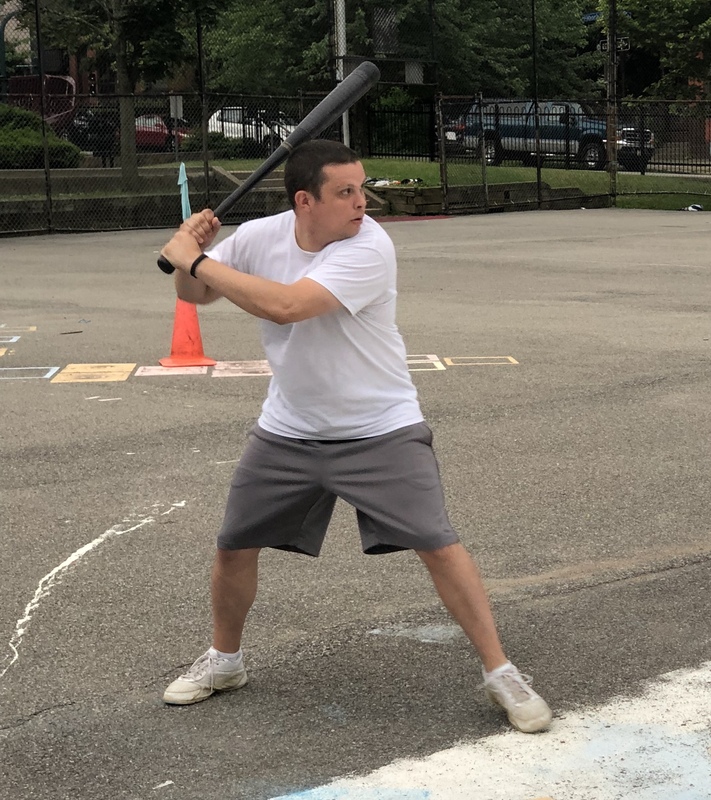 Playing without their MVP candidate and team captain Bob, Loss Mitigation relied heavily on their other MVP candidate, Mike, who did the heavy lifting in a game 1 win over the Porkswords. 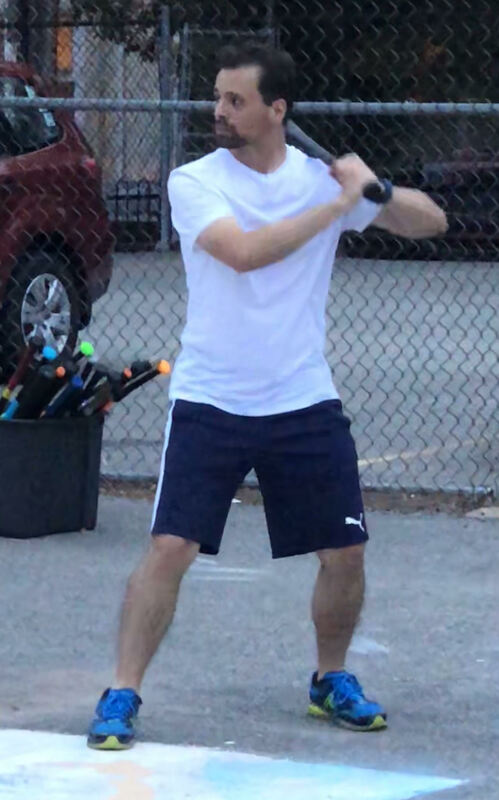 Mike went a perfect 6-for-6 with a single, two doubles, a triple, and two homers, hitting for the cycle and driving in four of the Loss Mitigation runs. His two-run homer in the bottom of the fifth gave Loss Mitigation a two-run lead, which the Porkswords couldn’t overcome in the top of the sixth. Nate pitched the complete game win for Loss Mitigation, and overcame big games from Adam and Frosty on offense. 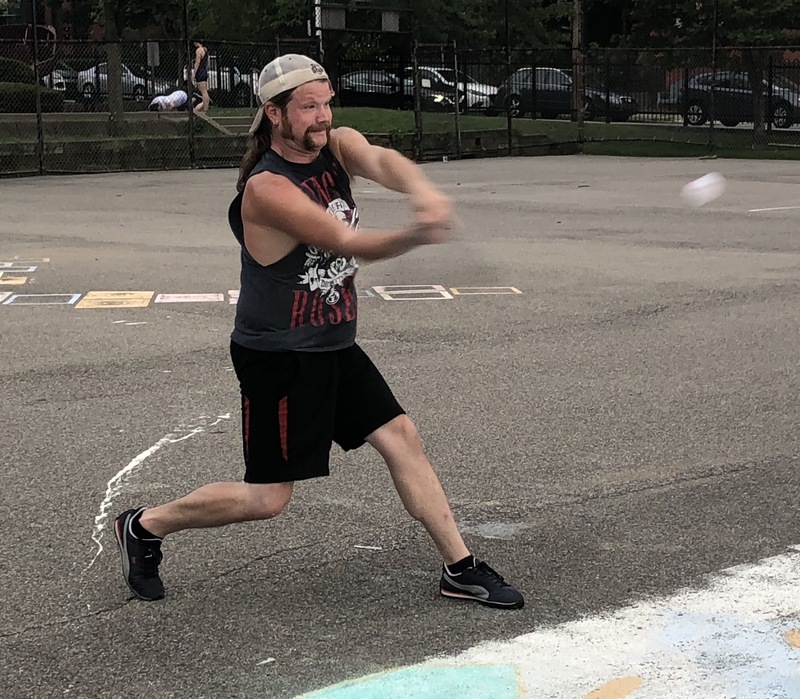 Nate started on the mound for Loss Mitigation, and after a strong regular season as a starting pitcher, the Porkswords hit him harder than anticipated in game 1. Adam led off the game with a double, and Josh gave the Porkswords a 1-0 lead with an RBI double before Loss Mitigation had recorded an out. Nate buckled down, retiring the next two batters, Bob and Frosty, to strand Josh at second and end the inning. Frosty, who hadn’t been seen on the wiffle diamond in years, appeared on the Porkswords playoff roster. Here he is with his new teammate, Bob. Josh took the mound for the Porkswords, and he escaped the first inning unscathed. Mike led off the game with a double, but Loss Mitigation couldn’t capitalize. Josh retired Nate and Norris to end the inning, and the score was 1-0 through an inning. Nate rolled through the top of the second, retiring the side in order, and Loss Mitigation would provide him with plenty of run support in the bottom of the second. Reggie led off the inning with a single, and Mike drove him in with an RBI triple that tied the game at 1-1. Nate followed with a two-run blast to left-center, and Loss Mitigation led 3-1. Norris then tripled, and Reggie drove him in with a two-run blast to center, putting Loss Mitigation ahead 5-1. Mike then hit a solo shot to the absolute deepest part of center field, and the score was 6-1. Josh retired the next two batters to end the inning, but Loss Mitigation had posted six runs in the bottom of the second, taking an early five-run lead. Nate, who earned the win on the mound for Loss Mitigation, connects on a two-run homer in the bottom of the second. The Porkswords bounced back in the top of the second. 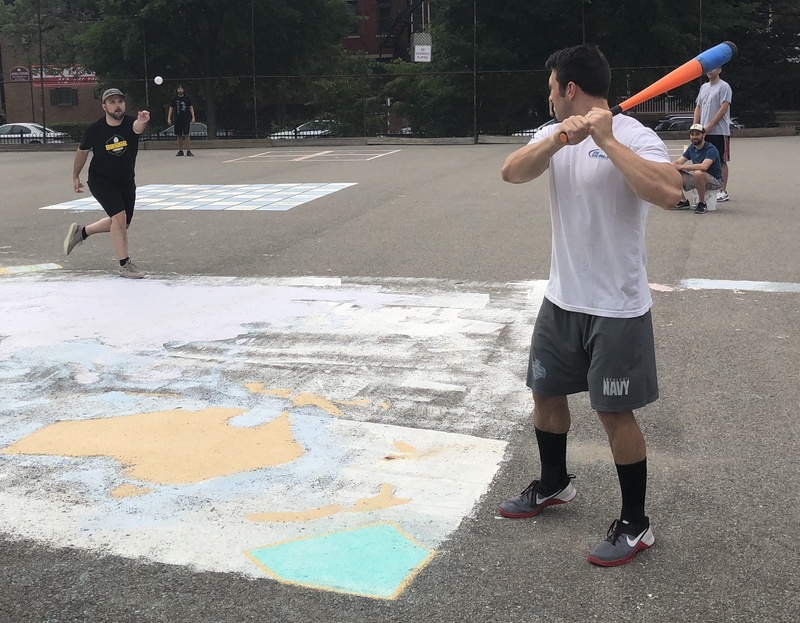 Frosty, an EWL playoff legend making his first wiffle appearance in years, doubled with one out, and Adam drove him in with an RBI triple that made the score 6-2. Josh followed with a triple, scoring Adam, and the score was 6-3. Nate struck out Bob to end the inning, and Loss Mitigation led by three runs. Reggie and Mike each singled to start the bottom of the third, but Josh escaped the inning, retiring Nate and Norris to strand both runners, and the score remained 6-3. The Porkswords would continue to chip away at the Loss Mitigation lead in the top of the fourth. Adam hit a solo homer with one out, cutting the deficit to 6-4. Nate retired Josh to end the inning, and the Porkswords trailed by two runs. Adam led the Porkswords in the game 1 loss, going 4-for-6 with four extra-base hits, including two doubles, a triple, and a home run. Josh struck out Reggie to start the bottom of the fourth, and after Mike doubled, Josh retired Nate to strand him at second, ending the inning. The Porkswords drew closer yet in the top of the fifth. With one out, Frosty connected on a solo homer to right-center, cutting the score to 6-5. Adam followed with a double, but Josh couldn’t tie the game, as Nate retired him to strand the runner, ending the inning with the Porkswords trailing by a run. Norris connects on one of his two hits for Loss Migitation. He went 2-for-5 with a single and a triple, scoring two runs. Loss Mitigation hadn’t scored since putting up six runs in the bottom of the second, and their lead had diminished to a run, but Nate would get more run support in the bottom of the fifth. Norris led off the inning with a single, and two batters later, Mike hit a two-run homer, his second blast of the game, putting Loss Mitigation ahead 8-5. Josh retired Nate to end the inning, and the Porkswords trailed by three runs heading into the sixth. Nate remained in the game to close things out for Loss Mitigation, and he retired Bob for the first out of the inning. Frosty then hit a one-out solo homer, his second round-tripper of the game, giving the Porkswords life and making the score 8-6. The rally would end there, however, as Nate retired Adam for the second out, ending the inning and the game. The 8-6 win gave Loss Mitigation a 1-0 lead in the best-of-five first round series with the Porkswords. – Nate pitched the complete game win for Loss Mitigation, allowing six runs on nine hits and striking out one in six innings. – Josh took the loss for the Porkswords, giving up eight runs on twelve hits and striking out one in five innings pitched. – Mike led Loss Mitigation on offense, going 6-for-6 with a single, two doubles, a triple, two home runs, three runs scored, five RBI, and he hit for the cycle for the second time in his playoff career. – Adam led the Porkswords at the plate, going 4-for-6 with two doubles, a triple, a home run, three runs scored, and two RBI. Tom K pitches to Joey, who set the pace for Cheap Goats, going 5-for-6 with a single, three doubles, and a solo homer. 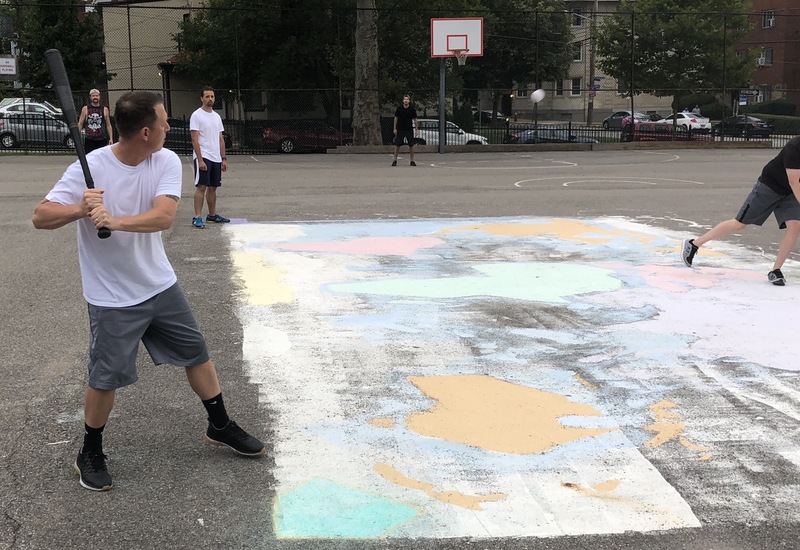 Joey went 5-for-6, with four extra-base hits, and Christian was effective on the mound, as Cheap Goats upset Shady Characters 6-4 in game one of the best-of-five first round series. Christian allowed only four runs on eight hits, and he also homered in the game, as Cheap Goats took an early lead in the series. Tom K, who had been diagnosed with a torn labrum, started on the mound for Shady Characters. He allowed a double to Joey in the top of the first, but stranded him, retiring Christian to end the inning. Christian started for Cheap Goats, and after allowing a leadoff double to Dylan to start the bottom of the first, he retired Tom W and Erich to end the inning with the game scoreless. Cheap Goats got on the board in the top of the second. Jordan doubled with one out, and Joey drove him in with an RBI double that made the score 1-0. The next batter, Christian, hit a two-run blast to right field, and Cheap Goats led 3-0. Dinger followed with a single, but Tom K escaped the inning, retiring Jordan for the second out. Christian and Cheap Goats celebrate at the plate after his two-run homer in the top of the second put his squad ahead 3-0. Shady Characters bounced right back in the bottom of the second. Jason led off the inning with a single, and he moved from first to third on Dylan’s second double of the game. Christian fanned Tom W for the first out of the inning, but the next batter, Erich, crushed a three-run homer to right field, and the game was tied at 3-3. Christian then retired Jason to end the inning. Cheap Goats pulled back ahead in the top of the third when Joey led off the inning with a solo homer. Tom K retired Christian and Dinger to end the inning, and Shady Characters trailed 4-3. Christian retired the side in order in the bottom of the third, and the score remained 4-3. Tom K matched him in the top of the fourth, as he sent Jordan and Joey down in order. Dinger, who went 3-for-5 with three singles, awaits a pitch from Tom K.
Shady Characters evened the score in the bottom of the fourth. Erich led off with a triple, and he scored from third when Jason grounded out for the first out of the inning. Christian retired Dylan for the second out, and the score was 4-4. Christian led off the top of the fifth with a single, and he moved from first to third when Dinger followed with a single. Tom K retired Jordan for the first out of the inning, but Joey followed with an RBI single, scoring Christian to make the score 5-4. Tom K then retired Christian to strand Joey and Dinger on base, ending the inning. Erich doubled with one out in the bottom of the fifth, but Christian stranded him, retiring Jason to end the inning, maintaining Cheap Goats’ one-run lead. Cheap Goats added an insurance run in the top of the sixth. Dinger led off the inning with a single, and two batters later, Joey hit a one-out double, scoring Dinger to put Cheap Goats ahead 6-4. Tom K retired Christian to end the inning, and Shady Characters trailed by two runs heading into the final frame. Christian remained on the mound for Cheap Goats to close out the game. He retired Dylan for the first out of the inning, and Tom W followed with a one-out double, putting the tying runner at the plate. Erich, who had extra-base hits in his previous three at-bats, was intentionally walked, putting the tying run on base and the winning run at the plate. Jason came up with runners on first and second and one out, but he couldn’t deliver. Christian got him to ground out to center, stranding both runners, and ending the inning and the game. Cheap Goats had held on to win 6-4, taking a 1-0 lead in the best-of-five first round series with Shady Characters. – Christian pitched the complete game win for Cheap Goats, allowing four runs on eight hits with one strikeout and one walk in six innings. – Tom K took the loss for Shady Characters, giving up six runs on eleven hits in six innings. – Joey led Cheap Goats on offense, going 5-for-6 with a single, three doubles, a home run, two runs scored, and four RBI. 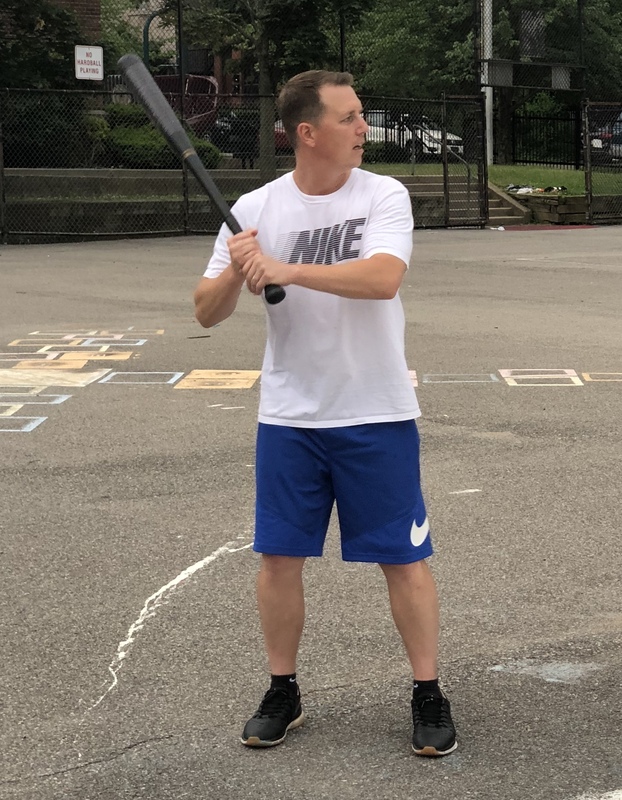 – Erich led Shady Characters at the plate, going 3-for-4 with a double, a triple, a home run, two runs scored, three RBI, and an intentional walk. 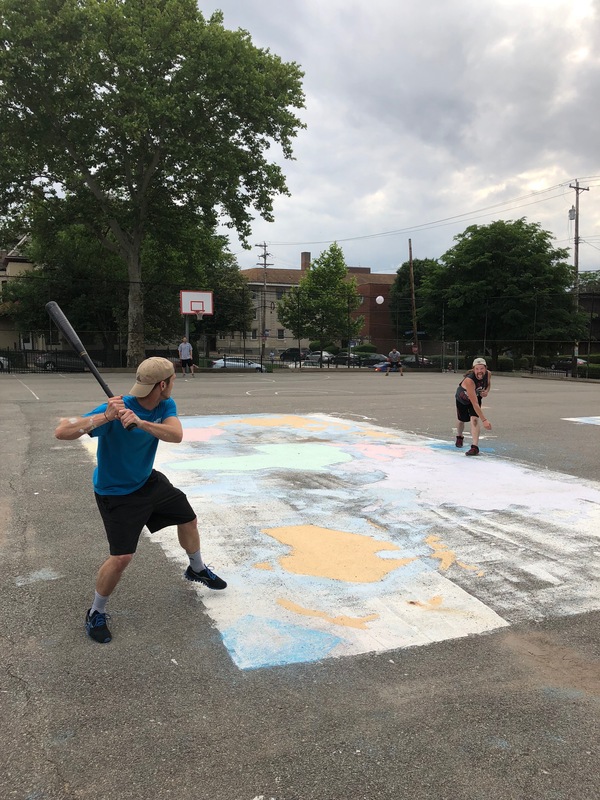 Dylan continued to swing a hot bat, hitting for the cycle, and Tom W had an incredible seven extra-base hits, as Shady Characters scored eight runs in the sixth inning en route to an easy 15-6 victory over Cheap Goats. 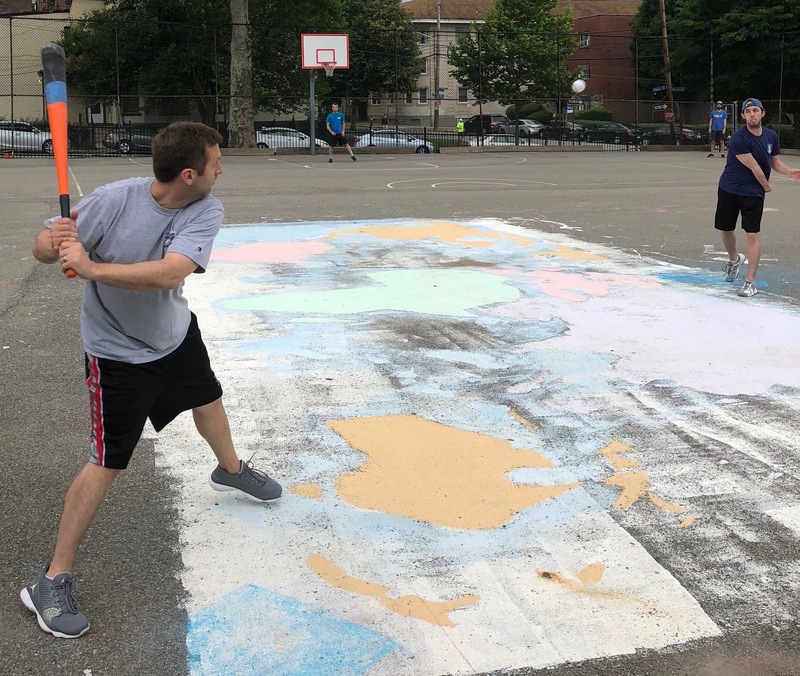 Erich also contributed four extra-base hits, including two homers, and Tom K had a career day at the plate, going 6-for-8, as all four Shady Characters contributed to the win. Dinger started on the mound for Cheap Goats, and Shady Characters got to him early. Dylan led off the game with a triple, and the next batter, Erich, crushed a two-run blast to right-center, giving Shady Characters a 2-0 lead. Tom W came up next, and he hit a solo homer to left-center, and the back-to-back jacks made the score 3-0 before an out had been record. Tom K followed with a double, and all four Shady Characters had reached base safely to start the game. It looked as if Shady Characters would blow the game open, but Dinger buckled down, retiring Dylan and Erich consecutively, stranding Tom K at second, and ending the inning. Tom W took the ball for Shady Characters, and he was effective early. Joey doubled with one out, but Cheap Goats couldn’t plate him, as Tom retired Christian to strand the runner, ending the inning with the score 3-0. Tom W led off the top of the second with a solo shot, his second homer of the game, and Shady Characters led 4-0. Dinger retired the next to batters to end the inning, and Cheap Goats trailed by four runs. Cheap Goats couldn’t rally in the second, as Tom W retired Dinger and Jordan in order. Tom W tripled with one out in the top of the third, and Tom K drove him in with an RBI single that made the score 5-0. Dinger retired Dylan to end the inning, and Shady Characters had a five run lead. Cheap Goats finally got on the board in the bottom of the third. Joey led off the inning with a triple, and two batters later, Dinger singled, scoring Joey from third to make the score 5-1. Jordan followed with a triple, putting two runners on with one out. But Tom W escaped the jam, retiring Joey to strand both runners, ending the threat and the inning with the score 5-1. Joey went 6-for-6 in the Cheap Goats loss, collecing three doubles, two triples, and a home run. Erich tripled to start the top of the fourth, but for the first time, Dinger escaped the inning unscathed. He retired Tom W and Tom W, ending the inning, and Cheap Goats trailed by four runs. Christian singled to start the bottom of the fourth, and after Tom W struck out Dinger, he gave up a two-run homer to Jordan. Joey followed with his second triple of the game, but Cheap Goats couldn’t drive him in. Tom W retired Christian, ending the inning, but Cheap Goats had cut the score to 5-3. 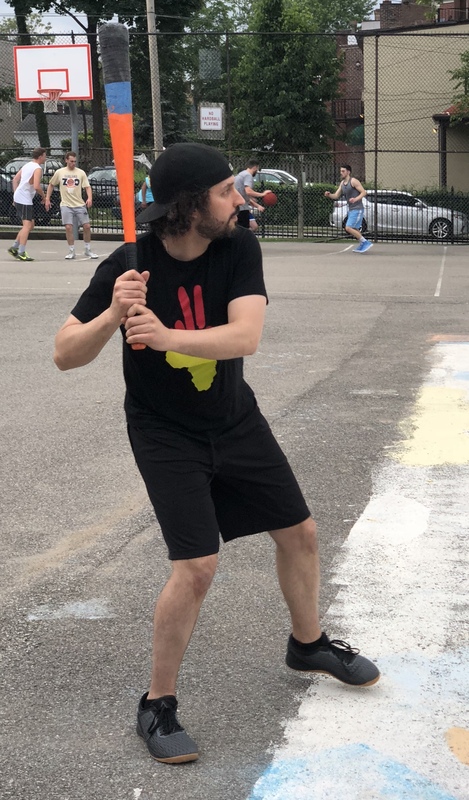 Jordan and his signature leg kick went 3-for-6 with a single, a double, and a two-run homer which pulled Cheap Goats closer to Shady Characters in the fourth. Shady Characters made up the difference immediately in the top of the fifth. Dylan led off the inning with a solo homer, pushing the Shady Characters lead to 6-3. Two batters later, Tom W tripled for the second time in the game, and Tom K drove him in with an RBI double that extended the Shady Characters lead to 7-3. Dinger retired Dylan to end the inning, stranding Tom K at second, and Cheap Goats once again trailed by four runs. Tom K also had the best offensive game of his EWL career, going 6-for-8 with two singles, three doubles, and a triple. Cheap Goats bounced back in the bottom of the fifth, starting when Dinger led off the inning with a solo homer. Two batters later, Joey homered, and Cheap Goats had cut the score to 7-5. Tom W retired Christian to end the inning, and Shady Character saw their lead decreased to two runs. Shady Characters blew the game open in the top of the sixth, extending their two-run lead to a ten-run lead with an eight-run explosion. Dinger retired Erich to start the inning, and then the wheels fell off. Tom W doubled, and Tom K drove him in with an RBI triple, making the score 8-5. Dylan followed with a single, scoring Tom K, and the score was 9-5. Erich then doubled, putting runners on second and third. Tom W cleared the bases with an RBI double, and Shady Characters led 11-5. Tom K once again doubled, scoring Tom W to extend the Shady Characters lead to 12-5. Dylan followed with a double, scoring Tom K, which made the score 13-5. 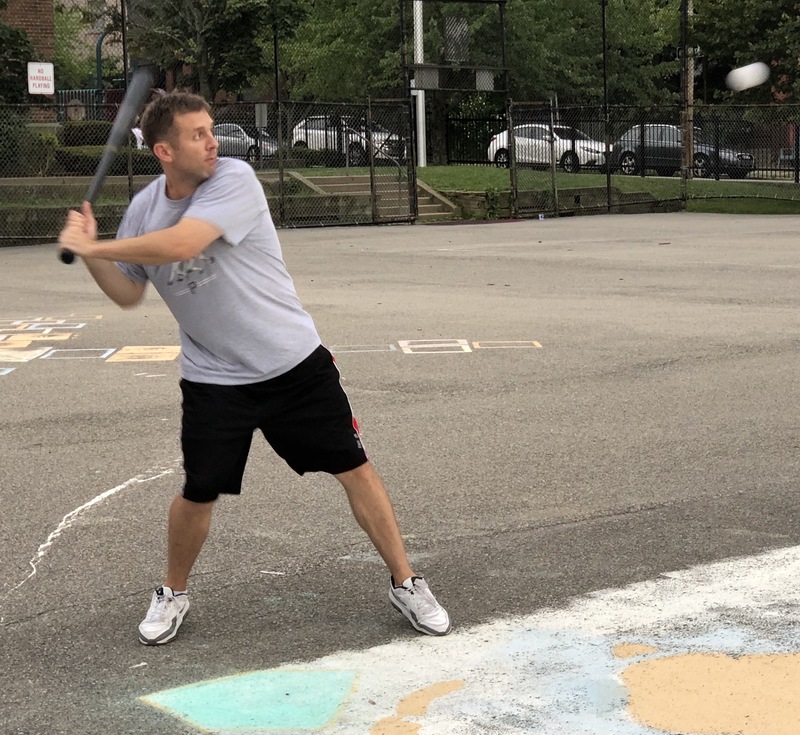 Erich then blasted a two-run shot to right, his second homer of the game, and Shady Characters had scored eight consecutive runs with one out, pushing the score to 15-4. Cheap Goats removed Dinger from the game, turning to Christian from the bullpen. The first batter he faced, Tom W, doubled for the third time in the inning. He moved to third when Tom K singled, putting runners on the corners. It looked as if Shady Characters would continue to pummel Cheap Goats, but Christian finally got out of the inning, retiring Dylan to strand two runners. Shady Characters had scored eight runs, all with one out, to take a 15-5 lead heading into the bottom of the sixth. Dylan connects on one his four hits. He went 4-for-9, hitting for the cycle. Cheap Goats showed a little heart in their last at-bat, but it was too little too late. Jordan doubled with one out, and Joey drove him in with an RBI double that made the score 15-6. 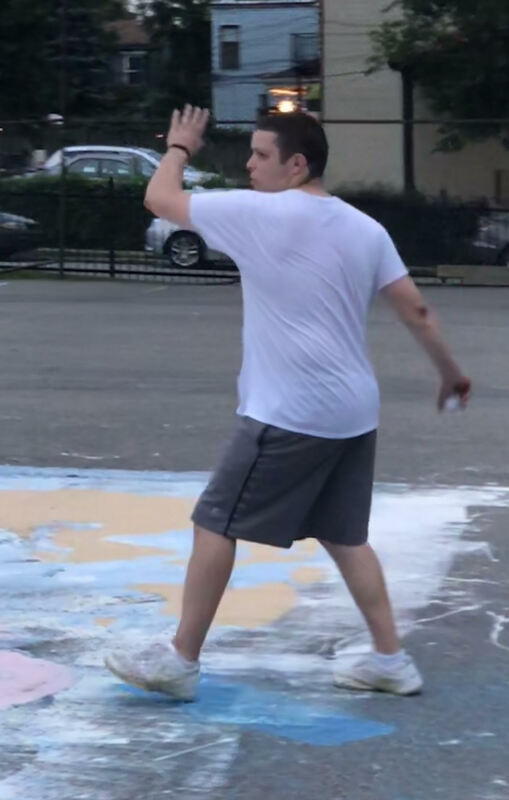 The rally would end there, however, as Tom K retired Christian for the second out of the inning, ending the game and giving Shady Characters a 15-6 victory. The win moved Shady Characters to 6-5 on the season, and the loss dropped Cheap Goats to 4-8. – Tom W pitched the complete game win for Shady Characters, allowing six runs on twelve hits while striking out one. – Dinger took the loss for Cheap Goats, giving up fifteen runs on twenty hits in 5.5 innings pitched. – Christian pitched a half inning of relief, allowing one hit and no runs. 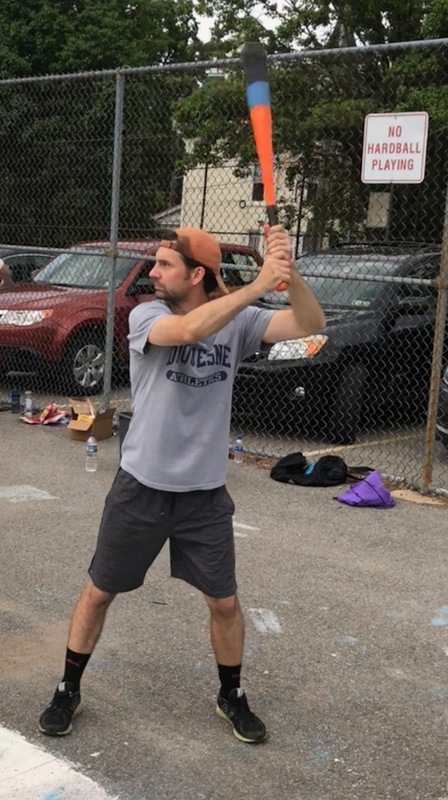 – Tom W led Shady Characters on offense, going 7-for-8 with seven extra-base hits, including three doubles, two triples, two home runs, six runs scored, and four RBI. – Dylan hit for the cycle for Shady Characters, going 4-for-9 with a single, a double, a triple, a home run, four runs scored, and three RBI. – Erich went 4-for-8, with a double, a triple, two home runs, three runs scored, and four RBI. – Finally, Tom K went 6-for-8 for Shady Characters, with two singles, three doubles, a triple, two runs scored, and four RBI. – Joey led Cheap Goats on offense, going 6-for-6 with three doubles, two triples, a home run, two runs scored, and two RBI in the loss. Loss Mitigation crushed the Porkswords by twenty runs as Bob and Mike each had eight hits, and Nate had seven hits while also pitching a complete game win, allowing only two runs in six innings. Bob and Nate each hit for the cycle, and Mike crushed four homers in another Loss Mitigation beatdown. Nate retired the Porkswords in order in the top of the first, and Loss Mitigation got on the board right away in the bottom half of the inning. Adam, the Porkswords starter, gave up a leadoff triple to Bob, and Mike drove him in with an RBI double that made the score 1-0. Adam retired the next two hitters, Nate and Norris, to end the inning, and it would be the best inning Adam and the Porkswords would have defensively in the game. Nate once again retired the side in order in the top of the second, and Loss Mitigation blew the game open in the bottom of the inning. Bob led off with a double, and Mike followed with a two-run blast that made the score 4-0. Nate then doubled, and Norris drove him in with an RBI double that put Loss Mitigation ahead 5-0. Bob tripled, scoring Norris to make the score 6-0, and Mike drove in Bob with an RBI double that extended the Loss Mitigation lead to 7-0. Nate hit his second double of the inning, which scored Mike to make the score 8-0. Adam finally recorded an out, retiring Norris, but Loss Mitigation wasn’t done yet. Bob singled, and he scored from first on Mike’s RBI single, putting Loss Mitigation ahead 9-0. Nate then hit a two-run homer, his third extra-base hit of the inning, and Loss Mitigation led 11-0. Adam retired Norris to end the inning, but Loss Mitigation had posted ten runs in the inning, and led by eleven through two innings. Bob hit for the cycle, going 8-for-10 with two singles, a double, four triples, and a home run. Nate continued to mow through the Porkswords in the top of the third, retiring the side in order, and was perfect through three innings. Loss Mitigation picked up where they left off in the bottom of the third. Bob tripled, his third triple of the game, and Mike drove him in with an RBI double that made the score 12-0. Nate then hit his second two-run homer of the game, putting Loss Mitigation ahead 14-0. Adam retired Norris for the first out of the inning, and after Bob tripled for the second time in the inning and the fourth time in the game (breaking the single-game record), Mike was retired to end the inning with Loss Mitigation holding a fourteen run lead. The Porkswords would get on the board in the top of the fourth. Adam doubled, and two batters later, Josh continued to swing a hot bat, hitting a two-run homer that cut the deficit to 14-2. Nate retired John to end the inning, and the Porkswords trailed by twelve runs. Adam deliver’s a pitch to Nate, who went 7-for-9 in the game, hitting for the cycle with a single, three doubles, a triple, and two homers. Loss Mitigation made up the difference in the bottom of the fourth. Norris singled with one out, and Bob completed the cycle hitting a two-run homer that made the score 16-2. Mike followed with a solo shot, and the back-to-back homers gave Loss Mitigation a 17-2 lead. Nate then doubled, his third of the game, but Adam avoided another nightmare inning, retiring Norris to end the inning. Nate pitched another perfect frame in the top of the fifth, retiring Adam and Bob in order. Loss Mitigation added a few more for good measure in the bottom of the fifth. With one out, Mike homered, and the solo blast made the score 18-2. Nate then tripled, and Norris drove him in with an RBI double that extended the lead to 19-2. Bob followed with a single, scoring Norris to make the score 20-2. Mike then homered for the second time in the inning and fourth time in the game, and the two-run blast put Loss Mitigation ahead by twenty runs. Nate and Norris each singled, putting runners on first and second, but the demolition would end there, as Adam retired Bob to strand both runners, ending the inning. Josh connects on a two-run homer to right. The blast provided the only two runs in the game for the Porkswords. Josh singled to start the top of the sixth, but the Porkswords couldn’t engineer a twenty-run rally. Nate retired John and Adam to strand the runner, ending the inning and giving Loss Mitigation a 22-2 win. The win moved Loss Mitigation to 8-3 on the season, and the Porkswords dropped to 5-7 with the loss. – Nate pitched the complete game win for Loss Mitigation, allowing two runs on three hits in six innings. – Adam took the loss for the Porkswords, giving up twenty-two runs on twenty-seven hits in five innings. – Bob, Nate, and Mike each had monster games on offense for Loss Mitigation. – Bob went 8-for-10, hitting for the cycle with two singles, a double, an EWL single-game record four triples, a home run, seven runs scored, and five RBI. – Mike went 8-for-9 with a single, three doubles, four home runs, seven runs, and nine RBI. – Nate went 7-for-9, hitting for the cycle with a single, three doubles, a triple, two home runs, five runs scored, and five RBI. – Josh led the Porkswords on offense, going 2-for-4 with a single, a home run, a run scored, and two RBI. Josh started on the mound for the Porkswords, and the first batter he faced, Dylan, singled. Erich followed with an RBI double, scoring Dylan to put Shady Characters ahead 1-0. Josh retired the next two batters, including striking out Tom K, to end the inning. Josh bounced back in the bottom of the first, leading off with a solo homer, ​which tied the game at 1-1. John would later single with one out, but Shady Characters starter, Tom K, retired Bob to strand the runner and end the inning. Shady Characters would jump out to a lead in the top of the second. Dylan led off the inning with a solo homer, and Erich followed with a homer. The back-to-back jacks gave Shady Characters a 3-1 lead. Later in the inning, Dylan hit his second solo homer, extending the lead to 4-1. Josh retired Erich to end the inning, and the Porkswords trailed by three. For the second consecutive inning, Josh started things off with a solo homer. His second blast of the game cut the deficit to 4-2. Tom K retired the next two batters to end the inning. Josh retired the side in order in the top of the third, and the Porkswords were behind by two runs. Bob tripled to lead off the bottom of the third, but the Porkswords couldn’t capitalize. Tom K retired Josh and Adam, stranding the runner and maintaining the two run lead. Shady Characters pulled further ahead in the to of the fourth. Dylan led off the inning with a double, and he moved to third when Erich followed with a single. Tom W then singled, scoring Dylan to extend the Shady Characters lead to 5-2. After Josh struck out Tom K for the second time in the game, Dylan doubled, clearing the bases, and putting Shady Characters ahead 7-2. Josh retired Erich to end the inning, and the Shady Characters led by five runs. Bob doubled with one out in the bottom of the fourth, but he was stranded for the second consecutive inning, as Tom K retired Josh to end the inning, and the score remained 7-2. Shady Characters added a few insurance runs in the top of the fifth. Tom W led off the inning with a solo homer, making the score 8-2. Two batters later, Dylan doubled with one out, and Erich drove him in with an RBI triple that put Shady Characters ahead 9-2. Tom W followed with a single, but Josh stranded two runners, retiring Tom K to end the inning. The Porkswords would make a small dent in the Shady Characters lead in the bottom of the fifth. Adam led off the inning with a solo homer, cutting the score to 9-3. Two batters later, Bob singled, and Josh followed with a single to put runners on the corners. It looked as if the Porkswords would rally, but with one out and two runners on, Tom K got Adam to fly out to right field, stranding both runners to end the inning. Erich squares up a pitch, as teammate Tom W watches. Erich was 4-for-7 in the game, hitting for the cycle with a single, double, triple, and home run. 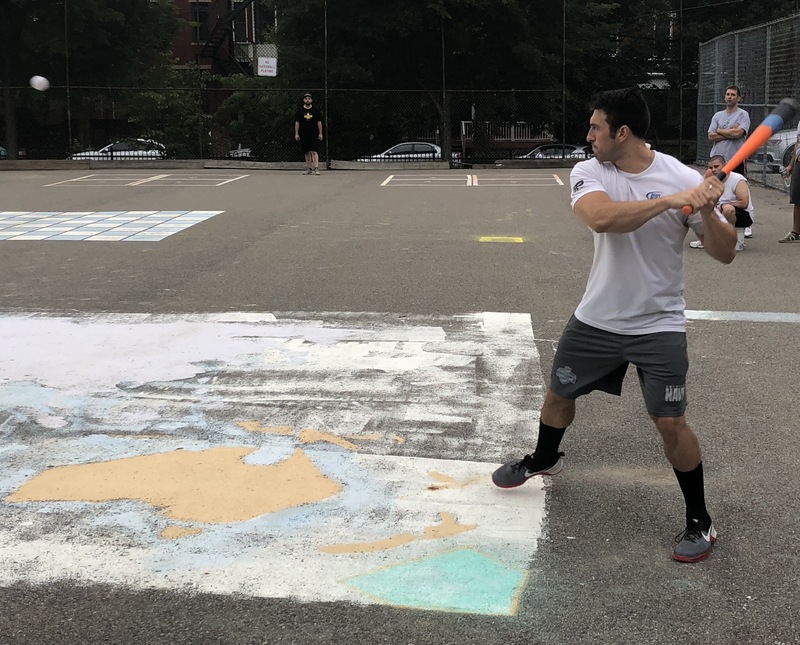 Dylan went 6-for-7 with five extra-base hits and four RBI, and Erich went 4-for-7, hitting for the cycle, as Shady Characters topped the Porkswords 9-5. 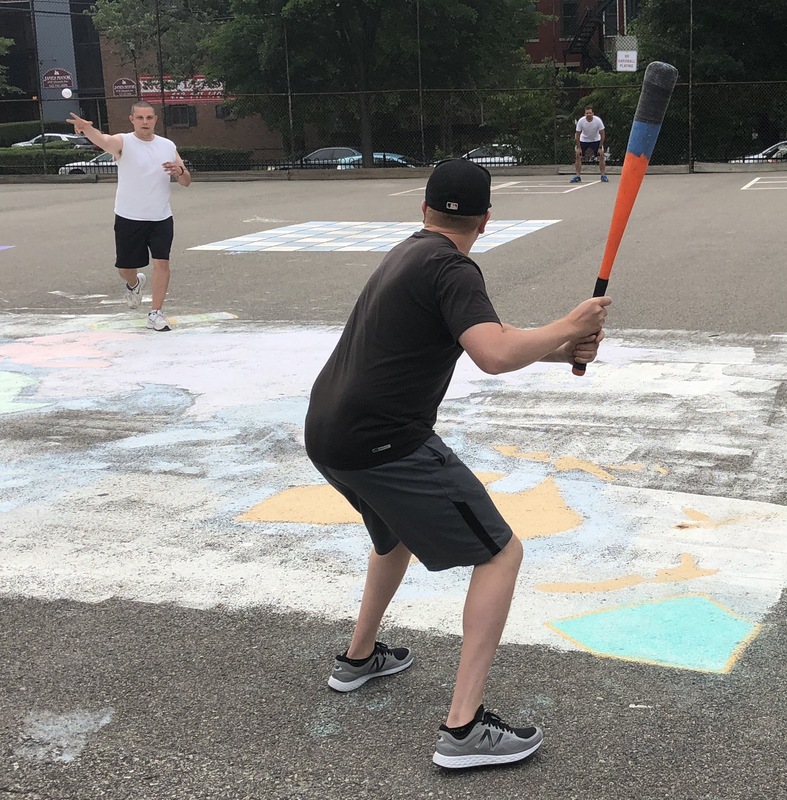 Josh went deep three times for the Porkswords, but it wasn’t enough, as Dylan and Erich combined to score seven runs and drive in seven as well in the Shady Characters win. Josh retired Shady Characters in order in the top of the sixth, and the Porkswords trailed by six runs heading into their final at-bat. Josh crushes a pitch to right for one of his three homers in the game. He went 4-for-6 with a single, three homers, three runs scored, and four RBI in the Porkswords loss. John started the inning with a single, and two batters later, Josh hit his third homer of the game, a two-run shot to right that made the score 9-5. Tom K ended the rally there, however, retiring Adam to end the inning and the game, giving Shady Characters the 9-5 victory. The win moved Shady Characters to .500 at 5-5 on the season, and the loss dropped the Porkswords to 5-6. – Tom K pitched the complete game win for Shady Characters, giving up five runs on ten hits in six innings. – Josh took the loss for the Porkswords, allowing nine runs on fourteen hits while striking out two in six innings. – Dylan led Shady Characters on offense, going 6-for-7 with a single, three doubles, two home runs, five runs scored, and four RBI. 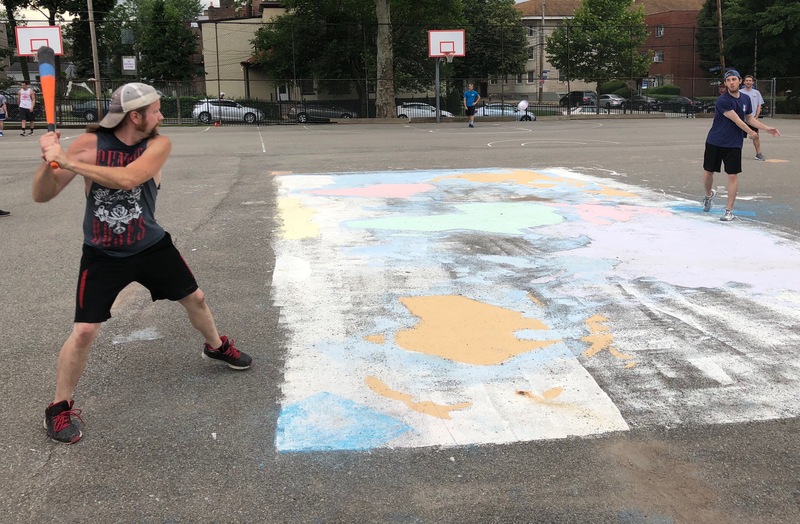 – Erich also had a strong game at the plate for Shady Characters, going 4-for-7, hitting for the cycle with a single, a double, a triple, a solo homer, two runs scored, and four RBI. – Josh led the Porkswords, going 4-for-6 with a single, three home runs, three runs scored, and four RBI.